on purchasing a Big Green Egg! We know you are excited to start enjoying The Ultimate Cooking Experience! Please read the Safety Tips and watch the instructional videos below for assembling, lighting, and temperature control. The Big Green EGG is extremely safe and hazard-free when used according to safety guidelines, and will provide years of trouble-free use and enjoyment. It is the user’s responsibility to maintain safe operation of the EGG and to exercise reasonable standards of care at all times. Do not attempt to modify or use non-Big Green Egg components inside your EGG as you may void the warranty, and modifications can lead to damage or injury. Don’t forget to read the Warranty and Register your EGG! We exercise great care during the manufacturing and packing processes to facilitate trouble-free assembly. Always use extreme care when moving or loading/unloading an EGG, as the product is heavy and includes many metal parts. You can easily follow the assembly instructions on your computer or mobile device, and a printable Online Manual (pdf document) is available for downloading. Select an EGG size to access manuals and instructions. To fill your EGG, we recommend using Big Green Egg Lump Charcoal, made from a selection of 100% hardwoods. It will heat quickly and burn cleanly. This video will show you how to properly fill your EGG. Make sure you never use lighter fluid or quick light charcoal products – you don’t want it to taint the flavor of your food. Lighting the charcoal is always quick and easy, as the design of the Big Green Egg allows air flow to circulate efficiently. Use a natural charcoal starter or an electric starter and never buy lighter fluid again! 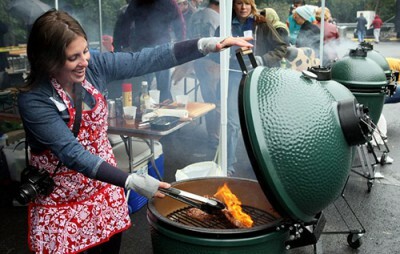 The EGG reaches its optimal temperature within minutes when using the Big Green Egg brand of lump charcoal, made in the USA from select cuts of oak and hickory for superb performance and results. Lighter fluids permanently contaminate your EGG with petrochemicals that taint the flavor of your food. Instead, use Big Green Egg All Natural SpeediLight™ Charcoal Starters or our Electric Charcoal Starter, both of which are odor-free and the fastest method of reaching a cooking temperature without any exposure to chemical fumes. Do not use charcoal briquettes, self-starting charcoal, or other similar products in an EGG. This may damage the gasket before it can properly seat itself. Your first few cooks should be under 350°F/177°C to allow the gasket adhesive to fully cure and adhere to the EGG. If you do damage the gasket, you can easily replace it with a self-adhesive high temperature replacement gasket available from any Big Green Egg dealer. Never quickly open a hot EGG all the way. “Burping” your EGG allows air to slowly and safely enter the dome, preventing any flare-ups that could escape from the front towards you. You should get in the habit of burping your EGG, especially if you have been cooking at temperatures above 300°F/150°C. Just raise the lid an inch or two and pause to burp it before raising the dome completely. Previous Big Green Egg cookouts leave behind a lot of leftover charcoal in the grill. Don’t let it go to waste! If you closed both the top and bottom openings after you finished cooking, the remaining charcoal can be reused. Before firing up the EGG, use an ash tool to rake the coals across the cast iron fire grate. The ash will fall through the holes of the grate and into the bottom of the EGG. Add charcoal if necessary to bring the level back to the top of the fire box. You can grill, smoke, roast and bake at exact temperatures by easily adjusting the patented air flow systems. You have total control over temperature at your fingertips, maintaining accuracy within a few degrees! The high quality temperature gauge provides precise readings to 750°F/400°C. Many indoor ovens cannot match the accuracy of the EGG’s temperature control! The temperature control system of the Big Green Egg allows you to cook in every season and weather condition – even rain or snow! Thanks to its high-tech ceramic composition, an EGG will endure and maintain extreme temperature differences irrespective of the weather.